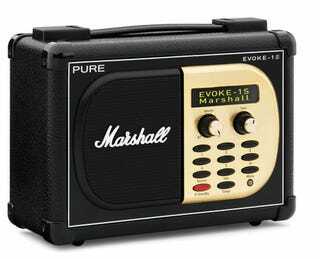 A few years ago, PURE had a real hit on their hands with the limited edition Marshall radio. Made in partnership with Marshall, this new EVOKE-1S goes all the way up to 11—digitally. Made from vinyl and wood, with brass controls and a metallic speaker grille, it's got a 3" drive unit and active-filters, and goes all the way up to 11 on the volume dial. The OLED screen displays audio info, and there are 30 station presets. It can also act as an alarm clock (though be wary of the 24hr battery life if you decide to unplug it and take it on the road), and has a USB connector for firmware updates, along with a headphone jack and aux-in for connecting MP3 players. It comes with a stand-alone Marshall speaker for a further £35, if you need even more volume.